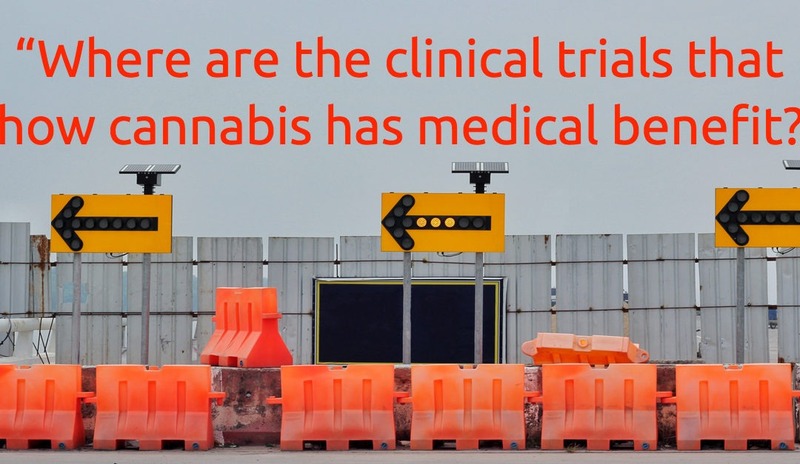 One of the most common questions asked by healthcare professionals regarding medical cannabis is “Where are the clinical trials that show cannabis has medical benefit?” This can be difficult to answer as cannabis does not have the same scientific backing that medical professionals are accustomed to seeing. A typical medication approved by the FDA will have clinical trials involving thousands of patients showing the benefits and risks of taking said medication. Accepted studies are blinded, placebo-controlled, randomized, and unbiased. Medications approved by the FDA have gone through rigorous studies showing repeatable and consistent results. Due to the Controlled Substances Act (CSA) listing cannabis as a schedule I drug, it is nearly impossible to obtain this same level of research on cannabis in the United States. In order to conduct a study on cannabis as medicine, and/or support rescheduling, the federal government must grant approval to conduct the research. Even if a researcher is able to get federal approval, there are still other entities that must approve the research. A new clinical trial may need to get approval from the National Institute on Drug Abuse (NIDA), the Food and Drug Administration (FDA), the Drug Enforcement Administration (DEA), institutional review boards, state-level departments, state boards of medical examiners, and/or potential funders. At any point in the approval process, just one of these groups can roadblock a potential clinical study. For example, the NIDA’s focus is on the cause and effect of drug addiction and abuse. They are not tasked with finding therapeutic benefits of currently illegal drugs. Less than 20% of the cannabis research funded by the NIDA in 2015 focused on the therapeutic benefits of cannabis. Once a clinical study gains all the approvals needed, more hurdles await. The only facility federally allowed to cultivate cannabis is the University of Mississippi. Any federally approved research must be approved by the NIDA before a product can be requested from this facility. Historically, the quality of a product produced at the University of Mississippi has not been equivalent to the products being cultivated and sold at dispensaries in medical and recreational states. The product received by researchers has often been frozen for long periods which can affect the potency of the product. Some researchers have reported waiting extended periods of time (up to years) to receive cannabis product after their request only to find it contains mold and is unusable. The University of Mississippi also lacks the variety of products that is available in dispensaries, thus limiting the applicability of clinical trial results. Due to these frustrations, researchers have put pressure on the federal government to loosen regulations on cannabis research. The NIDA has instructed the University of Mississippi to look at cultivating various THC concentration plants, and the DEA has increased the number of licenses allowed to grow cannabis for research purposes (although at this time, they have not awarded any further licenses). After a clinical trial has obtained the needed approvals and has received usable cannabis from the University of Mississippi, researchers still face an uphill battle on getting the study to be accepted by the medical community. One of the hallmarks of a widely accepted clinical trial is “blinding” of patients. “Blinding” refers to a patient, and researchers in “double-blinding”, not being aware if they are getting active treatment or a placebo treatment. In the case of cannabis research, adequate blinding can be difficult. The NIDA does provide a very low dose cannabis product (0.001% THC) that still has terpenes intact to retain the smell, but it is still difficult to truly blind patients due to the psychoactive properties of cannabis. If researchers do not assess whether patients were properly blinded, or if it is later determined that patients were not adequately blinded, the results will not be widely accepted by the medical community. Without wide acceptance of the medical community, national medical organizations will not come forward to support the use of cannabis as medicine. Authors: Josh Winningham, Pharm.D and Whole Plant Technologies, Inc.
“Scientists say the government’s only pot farm has moldy samples – PBS.” 8 Mar. 2017, https://www.pbs.org/newshour/nation/scientists-say-governments-pot-farm-moldy-samples-no-guidelines. Accessed 3 Jan. 2019.